Established in 1972, Catch a Canoe & Bicycles, Too! continues to provide a wide selection of redwood outriggers, canoes, kayaks, and bicycles for exploring beautiful Big River and beyond. Originally The Mendocino Yacht and Canoe Club, we are the coast’s only full-service outdoor shop, providing rentals, sales and service year-round for visitors and locals alike. A part of The Stanford Inn By The Sea — Mendocino’s premier eco resort, Catch a Canoe & Bicycles Too occupies the only privately owned land on the eight-mile Big River estuary. This 7,500 acre tract, now Big River State Park, was purchased in 2002 through the efforts of numerous state, federal, and nonprofit organizations, as well as thousands of private donors. Today, the Mendocino Land Trust works in partnership with the California Department of Parks and Recreation to manage and protect this valuable and beautiful area. 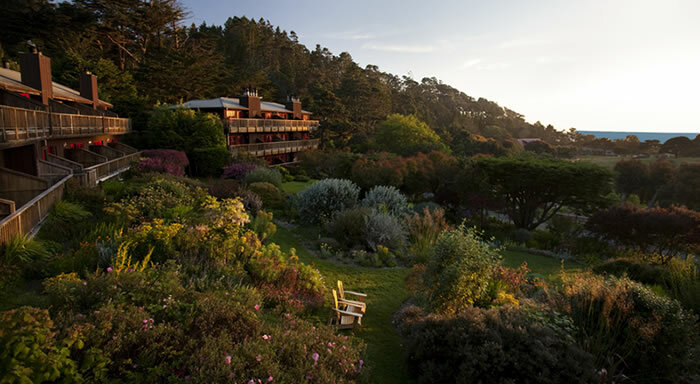 Nestled on a Mendocino Coast hillside, Stanford Inn, a Mendocino Resort, sits atop a meadow overlooking Mendocino Bay. Embodying the best of the rugged Mendocino Coast, this Mendocino Resort is a haven … an exquisite opportunity to reconnect with nature. The rambling lobby of the Mendocino bed and breakfast is spacious and welcoming. Guest rooms and suites of this boutique hotel in Mendocino are paneled in pine and redwood. Every detail is attended to, from wood-burning fireplaces set and ready to light to the sumptuous chef-prepared organic breakfasts. Inspired by the Stanford’s Certified Organic gardens, The Ravens’ Restaurant, featured in Oprah Magazine, is outstanding and nationally acclaimed for gourmet plant-based cuisine. This Mendocino eco-resort specializes in romantic getaways, is pet-friendly, family-friendly, and welcomes meetings, group retreats, and is especially popular for Northern California Coast weddings and elopements. 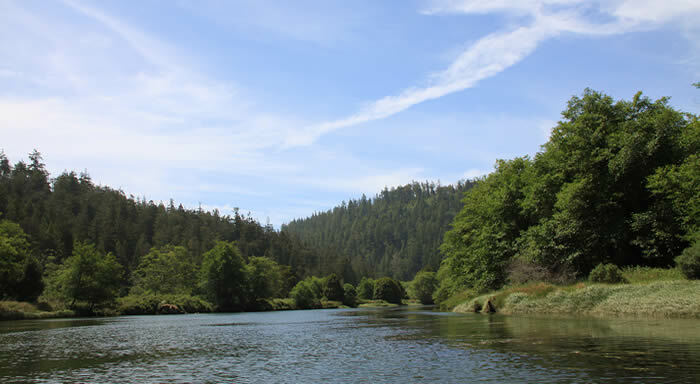 Big River flows fifty five miles westward from the rugged Coast Range into Mendocino Bay. Due to its slight gradient, the lower eight miles are tidal, providing paddlers with good depth year round. Nestled within California’s newest state park, the Big River estuary–including its abundant wildlife and adjacent lands–is now permanently protected. Paddling along silently in a non-motorized craft provides a stealthy means for excellent wildlife observation. Harbor Seals and their pups are seen daily during the summer, and if you’re lucky you’ll observe the playful River Otters.